Sandy Hill Seen | SEEN: Diversity as Strength – Ottawa's Eclectic Urban Destination – Working with Vanier, Lowertown & The Market for positive change in Ward 12. The new Ottawa Art Gallery (OAG) is going from strength to strength as the creative hub of switched-on, relevant contemporary art in Ottawa. The dramatic and beautiful interior, the quality and scope of the grand opening weekend (on par with galleries of any major international city), hosts to the vibrant Ottawa Fringe and now unveiling the latest work from iconic author and artist Douglas Coupland The National Portrait. Coupland has created a garden of delightfully colourful sculptures by scanning the heads of random Canadians in nine cities across Canada, including his hometown Vancouver and here in Ottawa. The digital files were 3D printed with the resulting biodegradable plastic casts warped, brightly painted and assembled into a stunning entourage. The massive work, created in partnership with La Maison Simons, is a collection of 1000 sculptures ranging in size from 5cm to almost a meter in height covering an allotted 20×20 feet. Certain stylized heads were named by genre, the tall willowy pieces being “asparagus heads”, the flattened ones “pancakes” and voyage around the work to find the “Gold Mine”. The longer one spends with the piece the more that is revealed. Many sculptures reside on vases from Coupland’s own home. It remained unanswered if the vessels are inanimate reflections of the human vessel they support or simply a found-use for the beautiful things acquired by the avid collector. The work will ultimately be displayed at a to be determined Simons. It takes a village to grow a garden and The National Portrait collaborative cross-country patch of delightful human beans sprouts at the OAG through mid-August. The contemporary art scene at its finest has arrived and it is at the OAG. We are thrilled for allsaints Event Space – Ottawa whose sensitive renewal was approved at Ottawa City Planning Committee today. The proposal to save the church in it’s entirety while replacing Bate Hall with a mixed use 9-storey structure will move forward creating a contemporary and viable space and business in the community. This latest success is down to tireless individuals within the local community that brought vision and gave much of their personal time towards seeing this historical building preserved yet renewed to serve the current urban landscape. There was considerable protest as is common in Sandy Hill towards developmental change so it was moving to listen in to the planning committee this morning and hear local voices speaking clearly, factually and strongly in favour of change, including Leanne Moussa Mathieu Fleury Suneeta Millington Francois Bregha Chad Rollins. The entire neighbourhood is grateful for the transformative contribution of these people in making this urban space liveable and desirable. Looking forward to hearing next steps and seeing shovels in the ground. An edited version of this review appeared in Apt613. 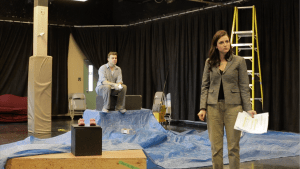 undercurrents continues to serve up provocative theatre as the unsettling Little Boxes tackles the impact of austerity and its levelling toll on self-identity in a taut drama from Gabrielle Lazarovitz and Brad Long. Paul (Carter Hayden) and Lauren (Lazarovitz) are living the educated and under-employed nightmare. She’s pulling triple duty while he’s lost his job and, despite their best plans, they find themselves harnessed to the anxiety driven hamster-wheel of suburban existence trying to make ends meet and cope with disillusion. The play drives through the couple’s past, present and future in the milliseconds following a life-changing collision. The set is the front seat of their vehicle on a roadway as they struggle to regain control of their lives following a momentary distraction that heralds a potentially life-changing future; a collision that puts their lives in sharp focus and makes them come up hard on who they are as the post-impact moment is stretched to a riveting 60 minutes of panicked flash-backs and flash-forwards. Little Boxes captures that quintessential car crash moment when time slows and a million thoughts are born through impact. The intimacy of the car is critical to the success of this piece. From singing along to a favourite song to the sense of suspended night-driving reality, no one is immune to the confessional attributes of this “safe space”. A seemingly non-linear journey as the action moves through past, present and future the set anchors the play firmly in the present moment of the collision circumventing any disorienting effects of shifting scenes. The on-stage complicity and chemistry between the two is faultless. Direction from Adam Paolozza is masterful as he moves Paul and Lauren naturally through jarring shifts in time and space: their dream potential, their wistful memories and the horrifying moment of impact. Paolozza constructs an undeviating flow to the collision with logical transitions despite having the actors shift time and gear from the gaming sofa of youth, future scenarios and the crushing existence of debt and unemployment. Lazarovitz and Long are accomplished writers confronting ambitious socio-economic and introspective identity themes with imaginative and impactful storytelling. The pivotal situation in Little Boxes is the springboard by which the phenomena of precarious employment and anxiety of survival are addressed. Once the providence of the unskilled worker, insecure employment has crept off the assembly line and floor shop into the boardroom and white-collar workforce. Little Boxes questions how subsistence impacts self-identity in a captivating narrative. Lazavoritz and Hayden as Lauren and Paul bring a steady believability to their roles despite the dizzying array of emotions and delivery demanded of them. Whether comedically on-point in superior “aspirational” mockery of neighbours or achingly bereft in the throes of self-disgust they are unfailingly familiar throughout. The on-stage complicity and chemistry between the two is faultless: a truly recognizable portrait of modern domesticity. As they reminisce about Lava Pit gaming and mall hook-ups in sweet retro nods, the simplicity of their past contrasts naturally to the complexity of their present. Capturing the zeitgeist and fragility of 2018, Little Boxes delivers a powerfully encapsulated moment that questions what remains “good” in people in crisis, when pushed to the precipice of subsistence and survival – are we all in it together or looking out for ourselves? See Little Boxes’ final show Saturday February 17th at Arts Court. How to Disappear Completely is a modern opus, anecdotal in its parts and unflinchingly truthful in its whole. It opens to a pitch-black stage as lighting designer Itai Erdal pulls back a curtain to reveal a film of his mother being interviewed on a beach in Israel. 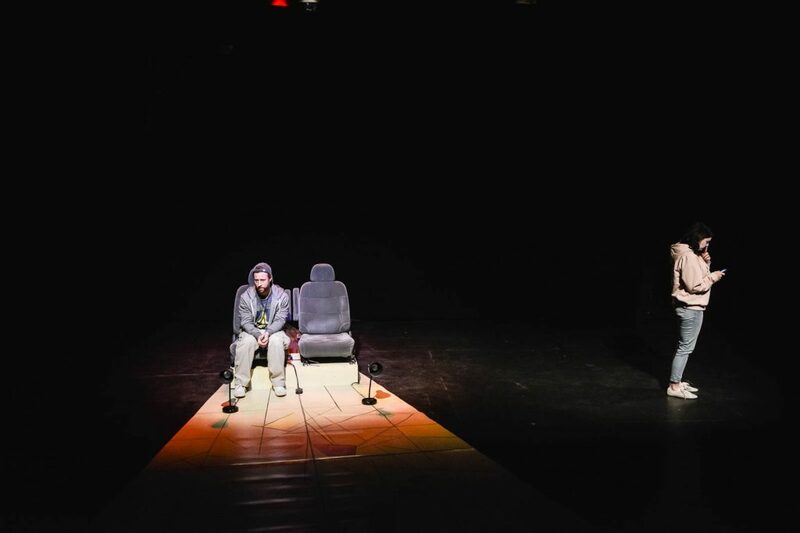 Erdal’s one man performance links storytelling to film and to lighting technology in this piece that kicked off when he received a 2001 phone call informing him of his mother terminal diagnosis. Erdal immediately rushed home to Israel to be by her side. A Canadian film school graduate, he ended up documenting her remaining months and her death, all with her permission. In fact, it was mostly his mother Mery’s idea: she even offered an alternate title “Towards my Mother’s Death,” a heading, we are told, that works much better in Hebrew. Having planned to become a filmmaker, Erdal diverted instead to a career in theater lighting, winning awards and mastering the most transitory effect of any live show. The hours of video were meant to become a film however a lack of financing and controversial content led to him cobbling what remained years later in to a theatrical work. Did I mention the rave scene? Itai Erdal in action. How to Disappear Completely goes well beyond documenting his mother’s final months. It covers a wealth of subject matter and characters, relationship dynamics and even a lighting design tutorial. Erdal runs, via a phone app, the lights throughout the performance, walking through various tools—the all-mighty shin buster—and techniques of his craft. At the outset, he explains how an actor framed by a square spotlight signifies an important reveal. He then tells of us his mother’s terminal lung cancer. The footage is honest, touching and raw. Erdal provides simultaneous translation for much of the dialogue in Hebrew—a task that both connects and distances him from the content. His mother lounging on the beach, astoundingly, clutching a cigarette, while interviewed by Itai or his sister Ayana. Mery is vibrant, responding with wit and sarcasm to probing questions about the disease in its early days as being flu-like. When pressed about what it “feels” like she drops candidly impressive insights: telling the camera one shouldn’t feel their body: “The definition of being sick is when you feel your body”. Later in incredibly moving footage, her husband leans in to kiss her bald head as he shaves it. More than a performance about death, though, How to Disappear Completely is about life, the relationships and choices we make. Despite an overtly morbid premise, it is in its entirety genuinely funny and even joyful. Going beyond the disease, we connect to Erdal’s family and friends. Recollections of a trip to Vanuatu where he and best friend Emir swim with a giant manatee to comical effect. The dynamics and challenges that bond him so tightly to his sister Ayana. His desire to start his own family. And, importantly, he engages us to Mery in life: her talkative, welcoming personality, her marital failures and successes, her late in life education, her career as a professor of Latin American literature, her friendship with his own friends. Throughout the 60 minutes, the weighty material of death, though present, is significantly lightened as Erdal weaves stories of sibling rivalry, friendship, and the rave culture of the early 90s. Engaging directly with the audience, challenging them to stump him in naming capital cities, and of course, there are the lessons in lighting. Yet still we travel through Mery’s decline and his own personal dilemma as her death draws closer and the devastating cancer takes hold of her brain. There is a contrasted irony between his craft, with the creation of transient lighting effects at the heart of this documentary performance that uses light to tell this story of a transient life. The effect is made more powerful by remaining unstated yet strikingly present. How to Disappear Completely is a rare treat, a one-of-kind performance that merits the many accolades it has won. So, see it for its empathetic and frank storytelling and, by the way, it has some great lighting too. How to Disappear Completely is at the Arts Court Theatre 14-19 February Thursday 7PM Friday at 9pm and Saturday at 1pm, with a talkback following the afternoon performance. Tickets are available online. Grab your whole family and stay for dinner, crafts and more. See details on the poster below. Carnival is held at the Sandy Hill Community Centre 250 Somerset St E with plenty of indoor and outdoor activities. Organizer’s are accepting donations of new winter wear. A wonderful opportunity to come together as a community and share with our more vulnerable neighbours. An edited version of this post also appeared in APT613. Provocative musical theatre opened at the NAC as Mr. Shi and his Lover revisits the stranger-than-fiction story of the 20-year affair between French Embassy employee, Bertrand Boursicot’s (David Kwan), and Pekinese opera singer Shi Pei Pu (Jordan Cheng) who Boursicot believed was a woman posing as a man. The story made headline news in the ‘80’s when the men were on trial in France for espionage with the Chinese government. What captivated the news cycle was Boursicot’s adamant belief that Shi Pei Pu was a woman, the mother to his child, and how this pretense had endured decades. In 1993 David Cronenberg’s M.Butterfly recounted the story from Boursicot’s point of view while here playwright Wong Teng Chi shifts the perspective to Shi with startling effect focusing on emotions over events. The shifting balance of desire, love, deception and performance all figure large as the narrative unfolds drawing skillfully on references from Chinese folklore to western pop. The joint Macau/Toronto production is performed exclusively in Mandarin with sur-titles in English the 75-minute production is unexpectedly accessible and an absolute visual pleasure to behold. The sparse set with little more than a dressing table and chair is framed by the accompanists; Composer Njo Kong Kie on piano and Yukie Lai on an imposing wooden marimba with Chinese percussions. Skillful lighting casts shadows speaking to the subterfuge and deception within the text while the music and spotlights create a dreamlike thrall as the piece explores where deception ends and blissful ignorance led by a master performer begins. Cheng and Kwan beneath the stark spot-light ignite the stage with enthralling performances, the elegance of their voices delivering grand drama against the handsomely minimalistic backdrop. Cheng’s narcissistic, conniving and distraught Shi works with unexpected asymmetrical synchronicity to Kwan’s solid, stuffy yet strangely potent bureaucrat Boursicot. The direction is sharp and stylized, like the set, leaving generous space for the acting skills of both actors as they delve in to the driving impulses of their characters. Teng Chi’s rendition is divided in to seven chapters that examine how desire, deceit, politics, gender, sexuality and nationalism guided their lives. Delicately, yet effectively, tentative truths are revisited while Shi’s sheer drive to “perform” weighs equally in the balance. While one or two chapters are challenging the script flows well while the sheer presence and musical abilities of both actors seemingly effortlessly deliver a contemporary chamber opera that is wholly exhilarating. A production as thrilling and unique as an out-of-earshot whisper that leaves as many questions as it answers.